COPIAGUE, Long Island (WABC) -- One of the four victims who was injured in a hit and run on Long Island over the weekend has died. Pierre Prophete, 23, was a passenger in a Chevy Blazer that was one of five vehicles involved in the crash on New Highway near New Horizons Boulevard around 8 p.m. Sunday. He was rushed in critical condition to Good Samaritan Hospital Medical Center, where he succumbed to his injuries. Police say a BMW and an Infiniti were both traveling southbound on New Highway at a high rate of speed when the vehicles sideswiped each other. The BMW, being driven by Michael Plummer, went off the roadway and struck a fence, while the Infiniti struck the rear of the Chevy, which overturned. The Infiniti then struck two parked vehicles before the driver fled on foot. 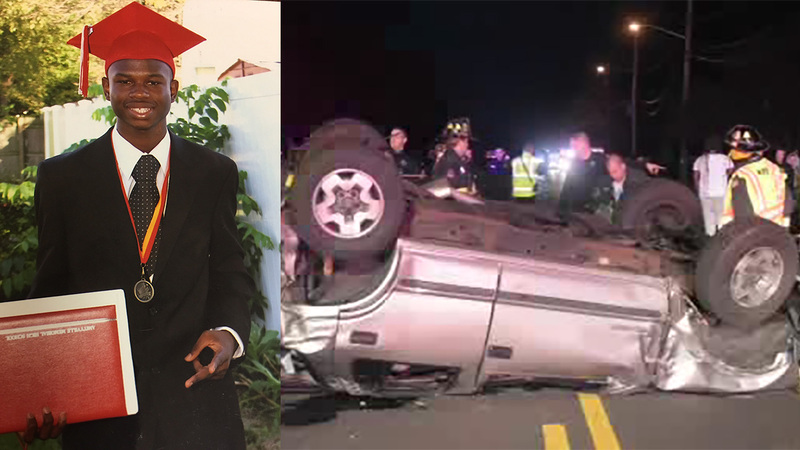 Plummer, 33, of North Amityville, was hospitalized at Good Samaritan with serious injuries, while the driver of the Chevy, 32-year-old Junior Joachim, of North Amityville, was transported to Nassau University Medical Center in East Meadow with serious injuries. Joachim's front seat passenger, 28-year-old Steve Clavin, was also critically injured. Prophete was in the back seat. The investigation is ongoing, and detectives are asking anyone who witnessed the motor vehicle crash or stopped at the scene to call the Major Case Unit at 631-852-6553 or Crime Stoppers at 1-800-220-TIPS.